Superior high output, high efficiency LED floodlight with a variety of NEMA distributions for lighting applications such as general and security lighting for large areas, port and rail centers, airport apron and interior or exterior sports. Glare has always been a concern with LED products and it has got increasingly more attention with higher output fixtures. Intercept changes that. The standard low glare shield blocks light outside of the main beam, so from other viewing angles the fixture virtually disappears. The low glare shields were also designed to have minimal impact on the total light output. Intercept’s precision TIR optics provide more light with less fixtures in application. This results in lower installation costs and higher energy savings while still achieving higher light levels, better uniformity, and consistent light output over a longer life than HID.g effects or general perimeter illumination. With outputs ranging from 3,000 to 17,000 Lumens, the Wall Director offers just the right amount of light for your projects needs. 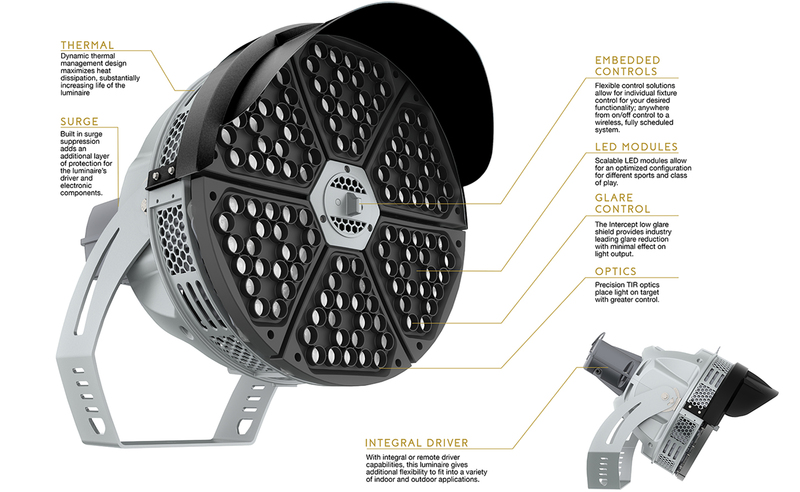 Intercept is available with a variety of distributions, color temperatures, CRI options, and a full suite of integrated controls to provide the best solution for any high output floodlighting application. Legacy HID systems gave us excellent initial light level and uniformity, but it was difficult to contain those light levels to the field. This presented challenges in reducing the spill light surrounding the field. The Intercept’s LED optics are recessed in a low glare shield giving the perfect combination of optical accuracy and cutoff. When aimed on the field this results in excellent light levels and uniformity throughout the life of the system, as well as a significant reduction in spill light.